From the Baldwin County Courthouse, go west on Hancock Street for 2 blocks or 0.2 mile (or the one large block containing Georgia College & State Univ.). Turn right on Clarke Street. Go one large block or 0.2 mile. Turn left onto Highway No. 22 (west) or Montgomery St. Go 5.0 miles. Turn right on Old Monticello Rd. Go 5.3 miles on Old Monticello Rd. 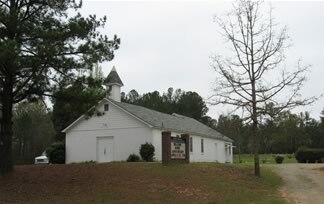 The cemetery is on the right side at 657 Old Monticello Rd. The cemetery was surveyed starting in the southwest corner in rows that went north, then back south, then back north, etc. with rows moving from west to east. Marker partly below ground. Hines Co. is supplier of marker. Mar'd. Jan 10, 1932 to Laconia J. Banks. "Give me my flowers"
Mar'd Jan 10, 1932 to Julius H. Banks. 2 graves - one a slab. Adult slab. Death year chipped off. A precious one from us is gone, Whose voice we loved is stilled, Her place is vacant in our home which never can be filled. To get a great reward; she fought the fight and kept the faith and now gone home to God. To get a great reward. He fought the fight and kept the faith andnow gone home to God. A beloved son, brother, husband and father. I have fought a good fight, I have finished my course, I have kept faith. The Lord is my shepherd. My trust is in God. 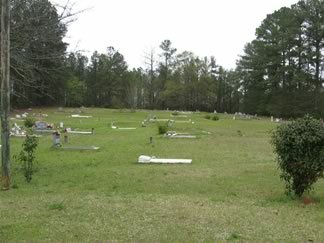 New grave as of April 5, 2008. A little time on earth he spent 'till God for him His angels sent. Sellers funeral home. "60" (60 years old?). Georgia PFC 3257 QM Service Co.
Other words not readable. Very questionable reading of inscription. Possibly "baby of" in inscription. Georgia TEC5 382 Engr Const Bn. 19 missing from before birth and death years. Georgia Pvt 51 Co. 157 Depot Brig. Another little Angel before the Heavenly throne. Shares headstone with Jimmy Hitchcock, Sr.
Shares headstone with Rev. Spencer C. Reeves. Beloved wife and mother. Beloved husband and father. Shares headstone with Otelia L. Reeves. Michigan Cpl 666 QM Trp Trans Co.